Whenever I quit playing MMOs, I always think it’s forever. I start playing single-player games, get fully immersed by them and then shake my head how I ever fell into the MMO trap, with its shallow stories, repetitive tasks and content droughts. But it’s always the same. It’s always about the people. I am still in touch with friends I have made over the years playing WoW, and we always reminisce about wanting to play together. My friend Shivali who is all around fantastic, probably has been the most consistent part of my MMO life, always playing with me where ever the waves of MMOs drop me ashore. We played Rift together, she created an EU account to play WoW with me when I gave up the US account, we played Wildstar together, and now she went ahead and tried the trial version of FFXIV. She liked it and so I decided I would go back to that game that I had fallen slightly in love with but then dropped after the free month you get with the box was over. I am glad I went back, because the deeper I dig into this game and its various WTF quirky systems, the better it gets. 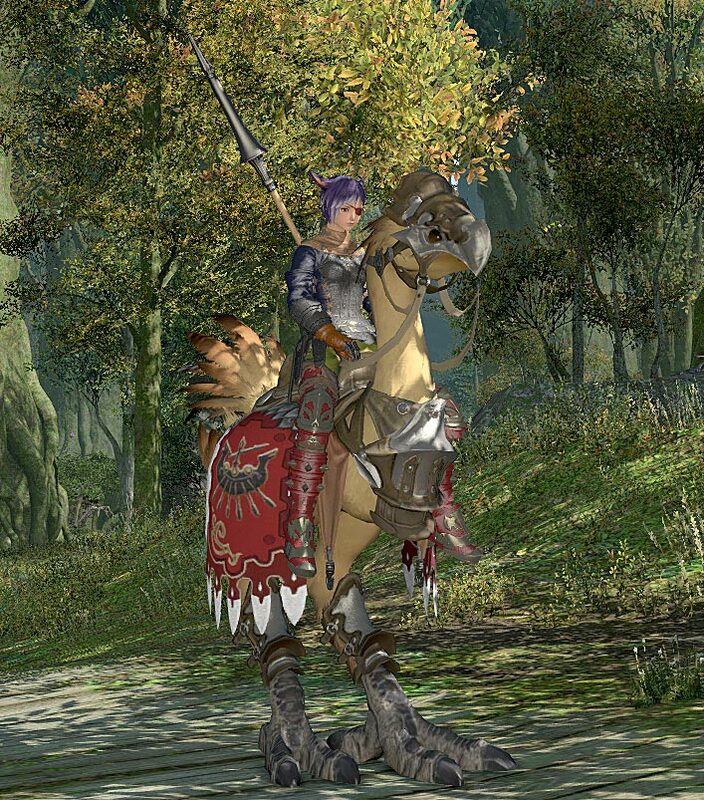 When I last posted, I was working on the chocobo mount and was level 21 on my lancer. In the meantime, I picked the Maelstrom Grand Company, making me a fancier version of a pirate, and did the grindy quests and Fates that award company seals which are used as payment for your mount, leveling gear or promotions within your company. Please meet Chocobon, my trusty Chocobo mount and defender. At level 30, you can unlock that your mount fights at your side. They have three different specs, tank, healer or damage, but you have limited control compared to, say, a WoW hunter pet. Still, it’s available for any class in the game and makes leveling a lot more pleasant while you are out in the world. Apparently there’s another kind of mini-game involved where you can change the color of your mount by stabling or breeding them, and I have to admit I didn’t fully get it just yet. It’s another of those quirky systems that you have to play with and that are very different from what I am used to. I will eventually play around with it, because Chocobon has a very dull brown color. But then, afaik, I will get a unicorn mount sometime. Seriously, a unicorn. What the hell! It is still mind-boggling to me, but you don’t really play alts in FFXIV. You just have your one character, and the world is your oyster. You can pick up any or all professions, and you can be any class you want to be after level 15. You don’t even have to change specs or anything of the kind. You just pick up a different main hand weapon and bam, you are that class. There are six martial classes (not counting the ones the expansion added), plus three caster classes. To make that even more complicated, you mix and match those classes to a so-called job, a more specialized and improved version of the classes. I started the game as a lancer, which is a melee class that uses lances and tridents and spears, basically incredibly long weapons on a stick. The improved job of a lancer is the dragoon. In order to unlock it, you have to be a level 30 lancer and a level 15 marauder, which is the tank class that uses 2-handed axes and plays a little bit like an Arms warrior from WoW. As dragoon you can use skills from the classes lancer, marauder but also pugilist, which is a weaponless monk-like class. My friend Ria just started playing and is going to be a ninja, aaaaaiii. In order to be a ninja, you need to be a level 30 rogue and a level 15 pugilist. While she catches up, I thought to give healing a whirl and decided I would want to be a White Mage, which is conjurer/arcanist. I now have the conundrum that I totally fell in love with healing in FFXIV and might not want to go back to the dragoon for a bit. Also, my cat lady is awfully pretty in robes. The cowls even show off her ears quite nicely! And that’s just a level 5 robe! Healing in FFXIV is quite relaxed, at least at my level. There’s the long global cooldown, the matching cast time, and I only really have three spells to use, which is Cure, the basic healing spell, Medica, an AoE heal and Ensuma, to remove a debuff. I know there will be more, especially of the support kind. But for now, that’s all. Damage is very smooth, with no real spikes, and so I find myself DPSing a little bit while the tank needs no heals. It’s a bit jarring going from click-healing to not doing that, but it’s fine. I am having so much fun, and from the rate it’s been raining player commendations on me, I seem to be doing well. Move over, dragoon, you might be looking badass, but I sense some pretty white mage outfits in my future. I am still too chicken to try tanking. All the tanks so far have been frighteningly competent. Maybe later, when I can field a full dungeon group just with friends. The thing that still gets me is that everything has a weird name. 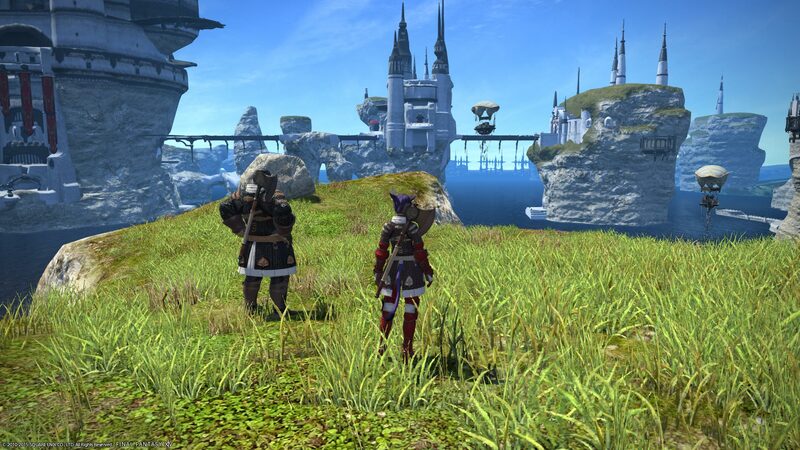 There are levequests. I originally thought they missed the ‘l’ but no. They’re repeatable quests that you get to do on a timer, and the speed of completion determines the amount of exp you get. You can do those for normal leveling, but I think most people probably do them for professions and gathering. Then, there are guildhests. Because the name was so odd, I didn’t do any, and now I can’t get enough of them. They’re basically mini-dungeons or scenarios that you do in a 4-man group and queue for. They teach you basic info on group play, and are pretty great exp for completing them the first time. 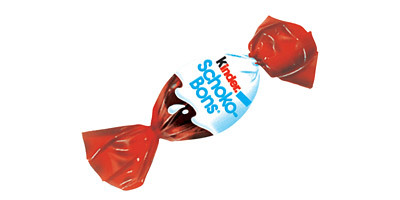 They’re quick, and really a welcome diversion. They made me miss WoW scenarios. I don’t know why those weren’t brought back. I have fond memories of the heroic scenarios from MoP. At least dungeons are still just dungeons and not some weird word, and they’re pretty much mandatory content in FFXIV. Most of the dungeons are tied to the main story mission, and thus you require a visit. The variety has been pretty good so far. I have visited a pirate hideout, a crypta, a mine, a former prison, an arena, a spooky manor, and an outdoor instance set in a jungle. Bosses mostly have interesting mechanics, though a lot of them are annoyingly add-based. Still, fairly creative for leveling dungeons. My experiences are still very positive. When a wipe happens, people work together so that the next time, it’s not a wipe. Did I mention healing’s been pretty pleasant? I think I did. 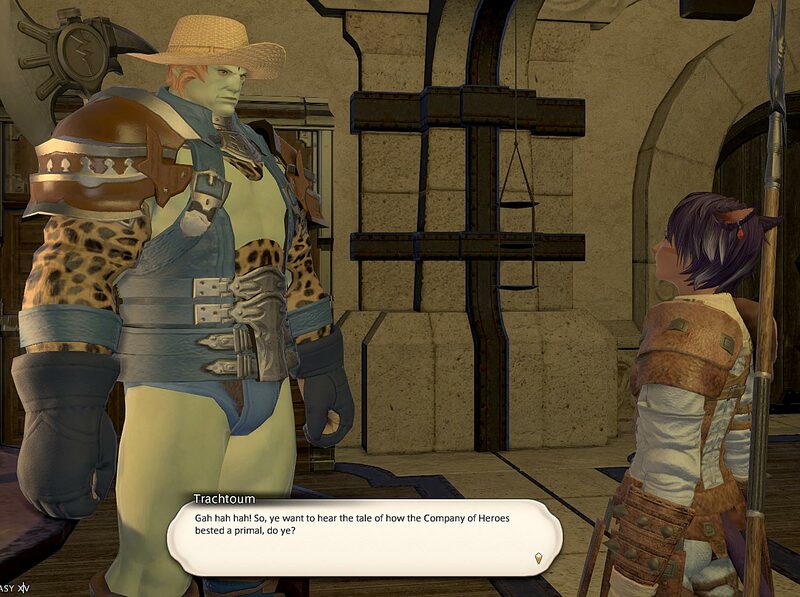 The shining glory of FFXIV is its highly touted story. It’s been an entertaining way to level, but up until I finished the Titan trial at level 34, it’s been fairly unexciting. For me, this is in large parts because Minfilia, the leader of the Scions of the Seventh Dawn, an organization you join, is so dishwater dull. She’s very very pretty, but she sends you on the most inane fed-ex quests. 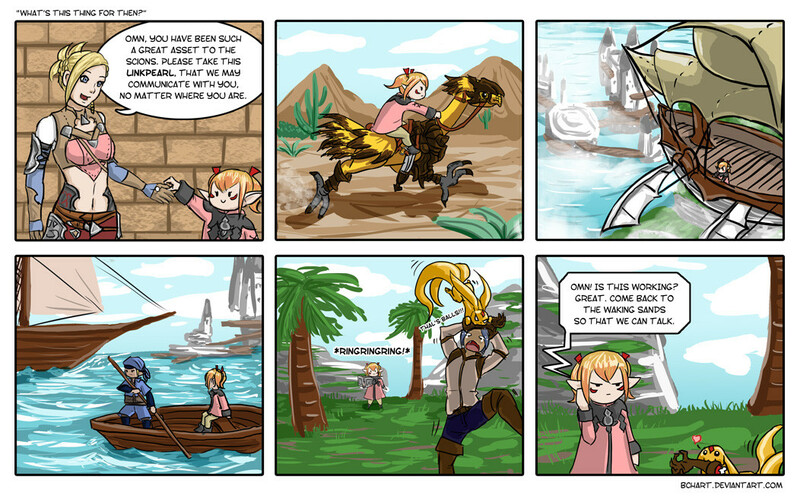 There are comics mocking those quests, because inevitably she asks you back to HQ even though you have a linkshell to use for communication. But the return to HQ after the Titan trial was my first wow moment, and I suddenly believe all those people who are telling me that they were moved to tears by the further events of the original game’s story. I still seriously wish though that Minfilia and the game in general had professional voice acting. I don’t know how they managed to hire Gideon Emery (Fenris from DAII, Lor’themar in WoW), and then nothing but crap for the rest. Minfilia is the worst for me. Now I can only imagine her if Laura Bailey had voiced her, instead of this very bored and boring, young voice actress that she really has. Despite the cringe-worthy voice acting and the many fed-ex quests, the story is engaging and keeps you pushing on. 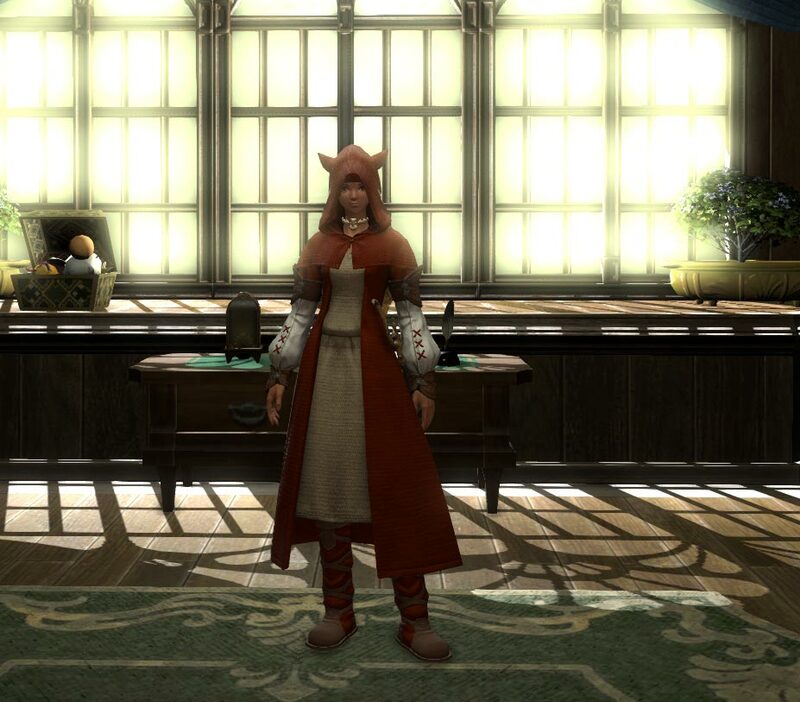 I can’t wait for my character to get White Mage to 35 so I can continue. Yeah, I don’t know what to say. I wanted to run screaming. Tanking is a lot of fun. Like the other roles, the game eases you into it. I might give it a try then. I just had my first run with a tank who couldn’t hold aggro against a single mob, and we finished anyhow. What’s the worst that could happen? It just looks like I need to level gladiator to 8 to get access to Flash. Regarding voice acting – it gets progressively better as the patches go on but in Heavensward they pretty much replaced EVERYONE with good voice actors. Remember, the game ws on a very limited budget at first.